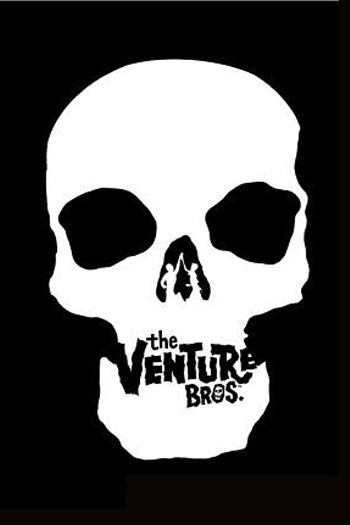 Ranking the Shows That I Watch – 8: The Venture Bros.
Venture Bros is a comedy and has a humorous tone at all times but takes its complicated web of continuity as seriously as any show I can ever remember on televison. This ridiculously confusing continuity is one of the strongest aspects of the show. What’s interesting about it is that it’s not as if all of it was planned out back when the show began; the writers seem to make something up, and then they keep that in mind when they work on later episodes and work around the changes they made. It seems like this make-it-up-as-you-go philosophy would never work, and feel slapdash (and ill-prepared – Lost, Heroes, anyway) but it just about never does feel forced. It feels very natural and thorough in a way that might be difficult to plot out from the beginning. Venture Bros. is the story of an egotistical scientist (Venture and the next show on this list and their arrogant main characters have a fair amount in common) Dr. Rusty Venture who was the son of an uber-popular super scientist and struggles with not living up to that legacy. He has two sons, Hank and Dean, the titular Venture Bros., and a bodyguard Brock Sampson. They have to contend with Rusty’s arch-villain The Monarch, bent on Venture’s destruction along with other villains like Baron Underbite and Phantom Limb. The show as a whole is a humorous take on programs like Johnny Quest and it’s silly and ridiculous, but it is so much more than simply a parody. The Venture Bros. lives in a world where villains are governed by an organization known as the Guild of Calamitous Intent which has rules, such as forcing villains to temporary release their captives for certain medical emergencies. Plot is central in the Venture Bros, but not in a true serial way – many episodes have plots which mostly are only relevant in their episode, even though anything mentioned is always fair grounds for a reference or to come back unexpectedly in later episodes. Some forces like Brisby and the Orange County Liberation Front pretty much never show up again, but sometimes characters that initially seem like one-offs like Sergeant Hatred go out and become semi-major characters. Because of the way episodes are often very non-serial even throughout a complicated continuing storyline, Venture Bros. has some episodes that are all-time classic and warrant frequent re-watches. Best episode of the most recent season: A few stand out, but it comes down to two. First, the first episode of the season, which skips around in time, and does it as brilliantly as any show or movie told with this device, with the ordering of the scenes is denoted by the value of an expensive comic book Dean has. Second, which is my official choice, is “Everybody Comes to Hank’s,” a film noir homage. While often the best episodes of the show involve utilizing many of the wide universe of characters Venture Bros. has to choose from, this episode focuses on very few characters, primarily Hank who acts as a gumshoe solving the case of why his friend Dermott didn’t get picked up by his mother, and in the process, figuring out whether Dermott is Brock’s son. He does this along with his sidekick, the Alchemist, a member of The Order of the Triad who gets some good screen time here. Anyway, the noir is spot on and some big time plot details come out of the episode in the process. Tags: Adult Swim, Cartoon Network, ShowRanking, The Venture Bros.
Dude, I couldn’t agree more. I love this show, and it bums me out that no one knows about it. I actually dressed as a character from this show (OSI era Hunter Gathers) for halloween and was amazed at how few people knew about it (only 2 people of very many got the character). Its such a great show, so thanks for plugging it. Hopefully this will get it popular enough to keep it running for a long time. I’ve only seen a handful of episodes from the first season, but based on that this sure as hell wouldn’t sniff my list. To be fair though, I’ve been told by multiple people that it improves after that, and I do know a lot of people who like it. I’ll give it another chance at some point in the future.